We have a Photo CD containing over 1900 photos of the origami hull construction process for sale. In addition we have a second CD containing 3 PowerPoint presentations about the construction & rigging of our mast plus a PowerPoint presentation showing how to build an efficient marine refrigerator and a PowerPoint presentation covering all of the interior work up to January 2010. We have assembled a group of over 350 pictures that cover the interior of MOM This starts with the bare steel and shows, step-by-step, everything we have done to complete the interior of our boat. 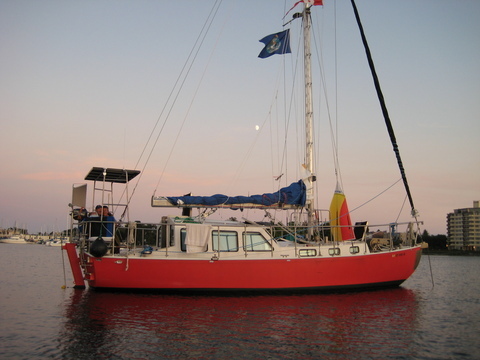 Also included is a complete guide to building a high efficiency 12 VDC refrigerator into a sailboat. This presentation has 250 high quality pictures plus detailed information on what was done aboard MOM to install this highly efficient marine refrigerator. The PowerPoint CD also contains the free PowerPoint viewer program.